He, she or ze? That is the question. As classes prepare to begin another school year---supposedly to educate---we are finding public education once again drowning in political correctness and frankly, insanity. The University of Minnesota seems to be leading the parade of insanity this week---while other schools gather in the staging area. Founding Father Noah Webster, and father of American public education, said, "Education is useless without the Bible." That disqualifies him from the elite who populate his schools today. The Bible says, "In the beginning, God created male and female." That too is a non-starter in today's public "education." Education that Webster would consider "useless" at the University of Minnesota is floating their newest take on human sexuality. And they're not alone. Their thinking is epidemic in public education. The Star Tribune reports that under the university's new gender identity policy, "Using the wrong pronoun could turn into a firing offense..."
The UM gender identity policy, while still in draft form, is designed to assure transgender men and women, as well as others, the right to use whatever pronoun they wish on campus---whether it's a she, ze, or something else. "And everyone from professors to classmates would be expected to call them by the right words or risk potential disciplinary action up to firing or expulsion," the Star says. The students will be permitted to choose their identity from the following list of personal pronouns: He/him/his; None; Prefer not to specify; She/her/hers; They/them/theirs; Ze/Zir/Zirs; Gender identity; Agender; Enter your own; Gender nonconforming; Genderqueer; Man; Nonbinary; Two spirit; Woman. The public university explains that all this would bar harassment and discrimination against transgender and "gender nonconforming" individuals." "And," they say, "it's designed, in part, to combat an indignity known as 'misgendering'---when someone is called by a name or personal pronoun they no longer use." Sophomore Michael Geiger, a campus leader of "Students for a Conservative Voice," thinks this is a bad idea. He told the Star, "To me, it's a bridge too far to cross for a person to tell me I have to say something...and if I don't, I can be punished." Well, he's not the only one who feels that way. The College Fix says this policy is "on a collision course with the First Amendment rights of university members." I also believe it is one more example of public education being on a collision course with Truth and reality. Why is public education obsessed with these kinds of policies? Because America has been obsessed for the past several decades with political correctness and identity politics. Last January, Josh Wagoner wrote a column for the Daily Caller titled, "How Political Correctness and Identity Politics are Destroying America." Some thoughts from Wagoner, and some of my own. A national poll last fall found that an astounding 71% of Americans believe political correctness is silencing discussions that would be helpful to our society, and 58% said they have views they are afraid to share. Not surprising, the majority---53% of Democrats said they didn't feel the need to self-censor, while 73% of Republicans and 58% of Independents felt they needed to keep their beliefs to themselves. The real power behind political correctness comes from identity politics, and that's exactly what is behind the nonsense at University of Minnesota and other schools across the country. At its core, identity politics claims oppressive forces, such as racism and sexism, virtually dominate our political and social institutions. It claims America's virtues and laws have harbored these evils rather than opposed them. By design, it attacks the integrity of our institutions with the unfounded claims of "systemic racism and institutional oppression." President Barack Obama was a banner carrier for this ideology. And he still is. When political correctness and identity politics drives our education system, our public schools devolve into public indoctrination centers for those furthest to the Left. Anti-bullying programs morph into gay lifestyle sensitivity sessions in the name of political correctness. Environmental science becomes UN Agenda 21 training. Civics becomes social justice indoctrination. The ultimate problem with political correctness is that the concept itself is not only irrational but is diametrically opposed to free speech. And that is at the heart of this insane new proposed policy in Minnesota. George Orwell famously said, "If liberty means anything at all, it means the right to tell people what they don't want to hear." Freedom is about having a voice. And a choice. 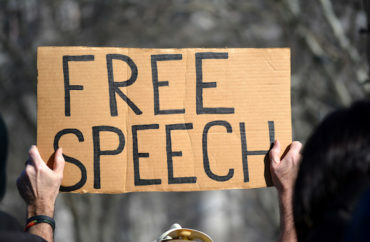 Our education institutions seem bent on only giving voice to a chosen few at the tip of the politically correct spear. If you don't affirm their agenda you can't talk. If we lose our voice we will lose what it means to be American. Racism cannot defeat racism. Evil cannot defeat evil. And we must take personal responsibility for our own lives and choices. These people foster the notion that anything an individual does is the result of some unjust act by someone else, somewhere else. Ronald Reagan said, "We must reject the idea that every time a law's broken, society is guilty rather than the lawbreaker. It is time to restore the American precept that each individual is accountable for his actions." More importantly, Scripture says, "So then each of us shall give an account of himself to God" Romans 14:12. Why do we 'need' a new set of personal pronouns? The old and never wrong 'He', She, and 'It' are all inclusive. If someone is thinking about punishing me for using the incorrect pronoun, they had better be able to prove they were wearing very large and prominent badges proclaiming what they are (maybe similar to but much more noticeable than the 'Jude' badges the Jews were required to wear in Nazi Germany.